Now that you’ve got a solid understanding of layered mattresses after reading our last post, Layered Foam Mattresses are the Easiest, Most Affordable Way to Get a Custom Bed, we at The Foam Factory felt it would be helpful to offer a few examples of mattress builds you can create with our foam. In these builds, we’ll touch on different ways you can create a mattress for any preference. We’ll start off with an affordable mattress that can be built on nearly any budget! The foundation is the most important part of a bed, even on a budget. To keep from draining your wallet, a Poly Foam base layer is the best suggestion for an economy mattress. We don’t advise going thinner than 4” for any foundation, as the ability to offer support diminishes under that mark. 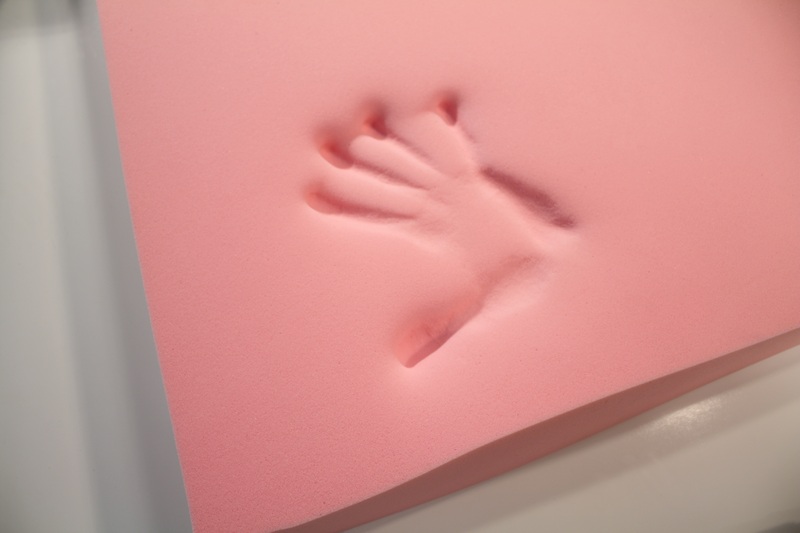 Poly Foam has a lower density than our highest-quality foams, but with mid-grade firmness it provides a strong, comfortable base. You can order a thicker base, but a 4” base should be sufficient while saving you some money. For the top layer in an economy mattress, our suggestion is Super Soft Foam. Super Soft will give you superior cushioning in a comfort layer that builds off the foundation’s support. For a person of average size and weight, you can get away with a 2” Super Soft comfort layer for a plush, luxurious sleep experience. Combined, the two layers create a balanced, 6” mattress that can give you great sleep without needing a second mortgage. “Give me the softest mattress you have” is a request that often ends up with us taking home a mattress that’s negligibly softer than the bed being replaced. With foam layered mattresses, you can build a bed that’s softer than you ever imagined one could be. Even on the softest bed, you still need support from the foundation. For a pure-comfort build, we suggest a 4” HD36 medium-feel foundation, in either regular, or high-quality varieties. HD36-HQ has a greater density than the regular, but they both feature the same medium firmness. Atop the foundation, a 2” Super Soft Foam middle layer, paired with an HD36-HQ 1-1/2” convoluted eggcrate comfort layer, will give you supreme softness and comfort. 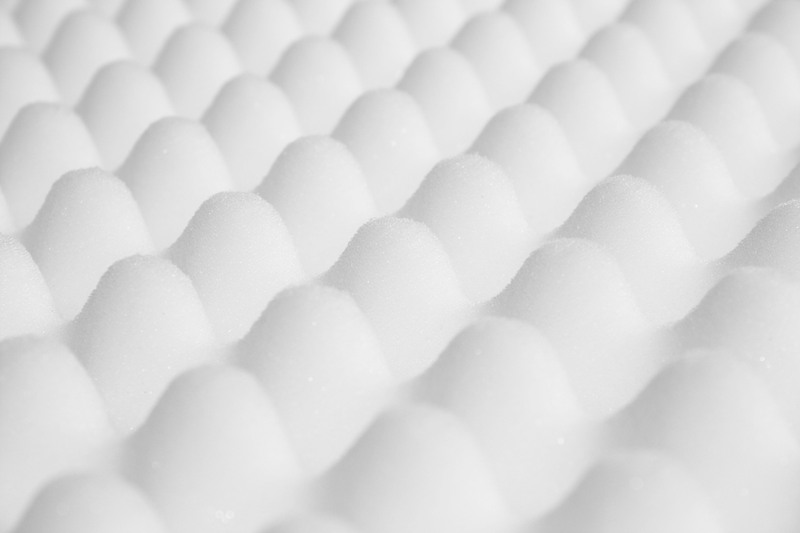 Eggcrate foam is softer than the same material in a solid sheet due to the peak-and-valley pattern, and with the HD36-HQ, you’ll get the softness you want with durability. The Super Soft provides ultra-plush padding between the comfort layer and the foundation. This three-part mattress will finally give you the “softest mattress possible” that you’ve been looking for. Sometimes comfort preferences change, leaving you with a bed that’s still in great shape, but not something you enjoy sleeping on. Perhaps you have guests who visit often and want a bed that suits all their needs. In a layered foam mattress, you can build a mid-range bed in terms of comfort and cost that also gives you the ability to alter its feel, should you or your guests’ preferences change. For a “Please-All” mattress, we suggest a double-base setup. This gives you a lofty bed, which is easier to get in and out of, and the ability to change the foundation build as needed. We suggest a foundation consisting of two 4” pieces: one HD36-Regular and one Lux-Regular. The HD36 is medium-feel, while Lux is firm foam. On this double-foundation, 2” of Super Soft is a fantastic comfort layer. The versatility in this mattress comes in the ability to shuffle layers. The most balanced “default” build for most people is 4” Lux-R on the bottom, then 4” HD36-R, with 2” Super Soft. This creates a well-supported, cozy mattress that’s not too firm. For people who like firmer beds, the 4”Lux-R can go in the middle, with the 4” of HD36-R on the bottom. And those not fond of the plush Super Soft layer can remove it completley; the two foundation layers can be slept on directly without any issues! Using this mattress build, you’ll have a bed with the versatility of a Swiss Army knife without needing a spare Swiss bank account. Sleep impacts every facet of our lives and, justifiably, some people prioritize their mattress’ quality over everything. Fortunately, building a premium layered foam mattress from The Foam Factory will still provide significant savings over pre-built mattresses, even using the highest-quality materials. For the longest-lasting durability and support in a base, you can’t do better than The Foam Factory’s 100 percent all-natural Dunlop latex. This 6” thick layer moves in immediate support of any pressure, and can serve as a fantastic mattress all on its own. Dunlop latex has the highest density of any mattress foam sold by The Foam Factory, at a 4.6LB rating. This means it has the greatest durability and resilience, perfect for a sturdy foundation. For the surface layer, the most luxurious, pressure-relieving, body-enveloping experience you can get is a 3” 5LB ViscoMax memory foam comfort layer. The highest density memory foam carried by The Foam Factory, it, along with the Dunlop latex base, comes with a 10-Year Warranty, ensuring its quality. Memory foam softens from the heat of the user’s body, allowing better circulation and comfort. This leads to less tossing and turning, and a more restful night’s sleep. Layering these two top-quality materials will give you a comfortable and supportive top-quality mattress you’ll love for years. *NOTE: Prices do not include possible taxes or shipping. For those looking for an ultra plush mattress, how would “The Cloud” compare to a similar setup with the HD36 foundation but with say a 4″ Memory foam on top of that? Would this be too plush? I’m trying to get close to something like the Tempur Cloud Luxe for comparison. Yes, that would be pretty close to how the tempurpedic cloud luxe is configured.